I took a Coursera course on Emotional Intelligence and Leadership. One of the assignments was to view Benjamin Zander’s Youtube video “How to Give an A”. I really liked what he shared in the Youtube video and got this book. I read it from cover to cover and got really excited about the description of these practices. My husband knew of Ben Zander* from the music world and was familiar with the book. He read it from cover to cover as well. 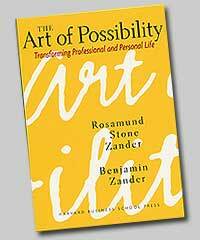 There are many life serving / transformational ideas in “The Art of Possibility”. Mr. Zander is a very energetic and inspirational speaker. I knew our parent audience will recognize how to translate his experience of using the orchestra as the metaphor for life into what each of us can do in order to shift towards more connection within ourselves, within our families, and within our communities. I went onto www.benjaminzander.com and noticed he was going to be in San Francisco on Oct 7th. After a few days of contemplation and gaining some nerve, I picked up the phone and called the number on his website. I spoke with Rachel and asked if Mr. Zander would consider coming to Los Gatos High School to speak to our parents. She said “Sure.” I thought it couldn’t be that easy! It wasn’t. There was a major roadblock and he said “No”. When you know this is not an opportunity to be lost, you persist in connecting with both the person and the cause that this person represents through the heart. At times, I sensed it wasn’t going in the direction I would like and I resisted forcing it into a certain direction. We then have a greater possibility of uniting through the partnership of wanting the same thing and the desire to contribute which then outweighs everything else. Because it has all been done through the heart. Here is an article recapping the evening: “Conductor orchestrates ‘the art of possibility'”.